I am a collector. I collect many different things: objects with texture, objects with history, images, and memories. I photograph what I collect and collect what I photograph. As photographers, we generally begin with the whole world in front of us and our personal vision emerges as we edit that which lies before us. When the decision is made, the shutter is tripped and a little piece of the world, that moment, is recorded on film or sensor. Once it is collected, it can be visited again and again by its owner. Usually photographers start with the capture and decide later how to present the image to others. It can be a straight print, manipulated image, black and white, color, or other. Upon viewing the collected images, the artist will let the image speak to how it wants to be seen. For me, this body of work happened in quite the opposite manner. I find it fascinating that the process can inspire the image prior to its capture. I can “see” in gum bichromate. When I look through the lens, I imagine how that little piece of the world will appear as a gum bichromate print. 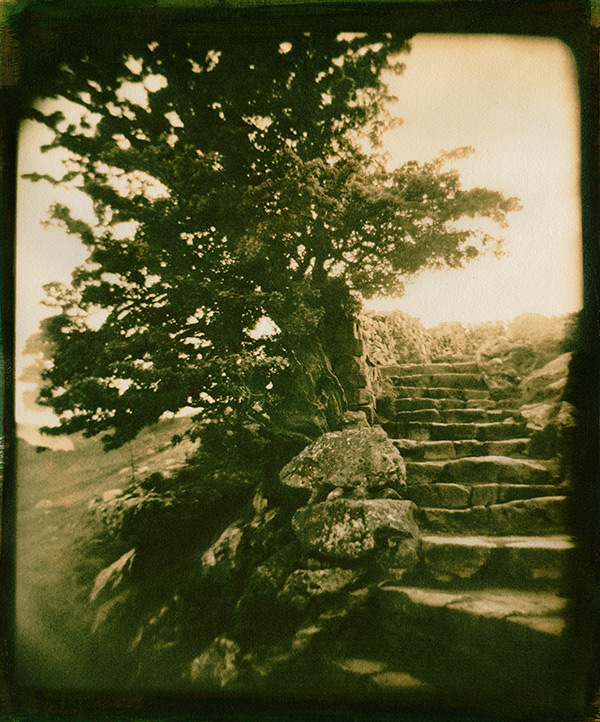 The images presented here are gum bichromate prints from my Mythical Garden Series. 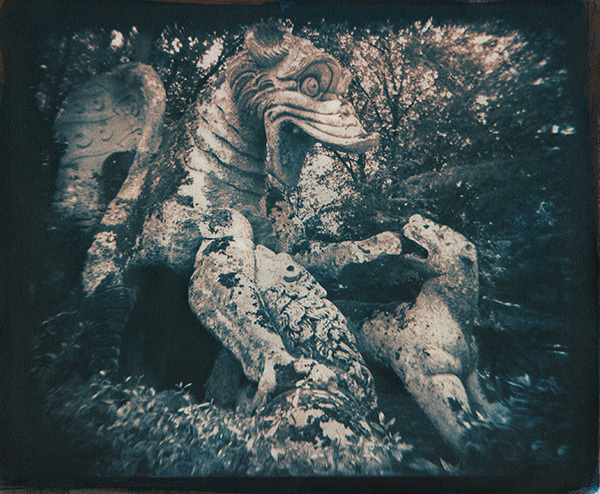 This series began in Italy when I decided to take a toy camera to Parco dei Mostri, a garden filled with 16th century grotesque sculptures, also known as Villa Barmarzo. Let me back up a bit. 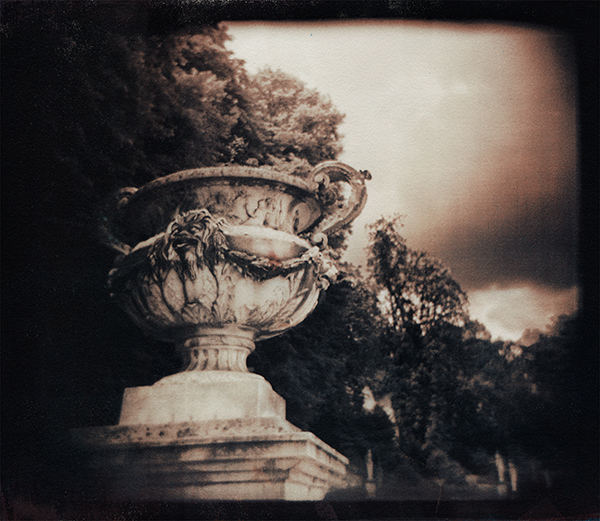 When I took my second photography class in 1980, I was fortunate to go to New York City to see a show of Eugene Atget’s Gardens on exhibit at ICP (International Center for Photography). I fell in love with his images, and to this day they still inspire me. I spent most of my photography life photographing historic architecture, first with 35mm infrared film and then with a swing lens panoramic camera. Fifteen years ago, when I revisited a process that I had learned in 1980, gum bichromate printing, I realized that the process and the sharp lines of the architecture did not create a good fit. The gum bichromate process is a 19th-century process that was a favorite of the Pictorialist group of photographers who worked between 1885 and 1915. Watercolor pigment is mixed with gum arabic and then photosensitized with dichromate (chromium salts). This emulsion is hand-coated onto the surface of paper under incandescent light. A negative is placed on top of the dried coating and exposed to ultraviolet light. After the exposure, the print is immersed in cool water. The areas of the image that are struck by light bond to the paper, while those that were blocked from light wash away, preserving the highlights. Several layers of translucent color are required to create a fully tonal image. Therefore the process of coating, drying, exposing, and washing is repeated up to five times. If I haven’t lost you yet, registration of a negative containing sharp lines is difficult, since the repeated washings change the paper size. After struggling with this for several years, I discovered the Holga toy camera. 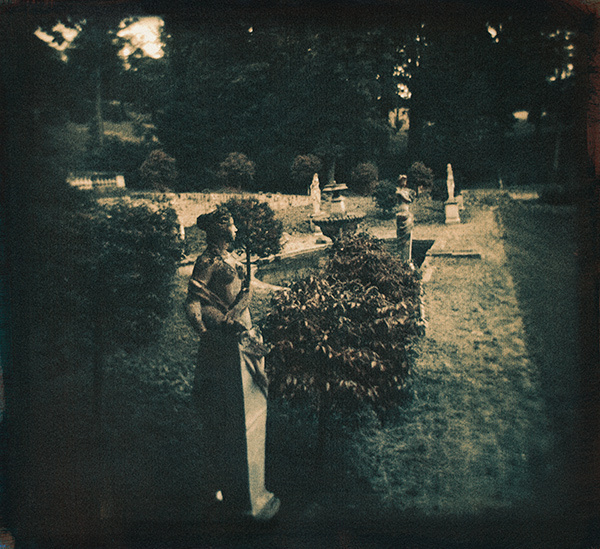 The Holga image is sharp in the center and soft at the edges. To me, the camera is perfect for the gum bichromate process. 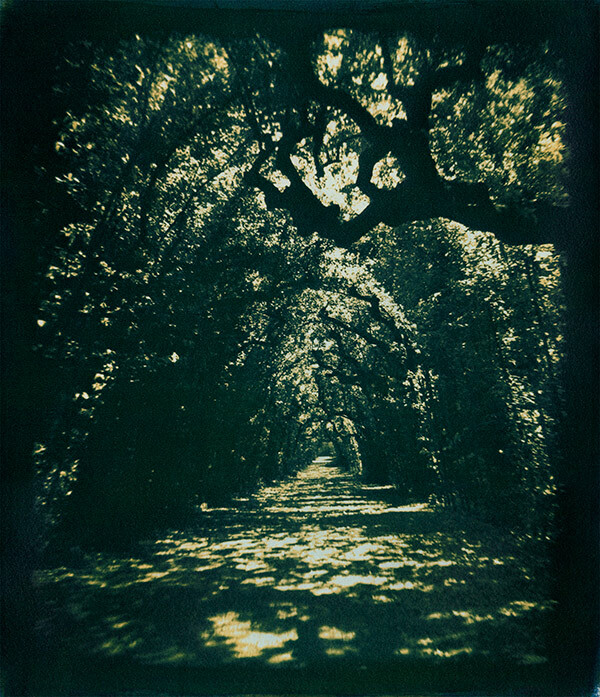 Armed with several Holgas, I journeyed to the gardens Atget had photographed and to the lush Renaissance villas of Italy. 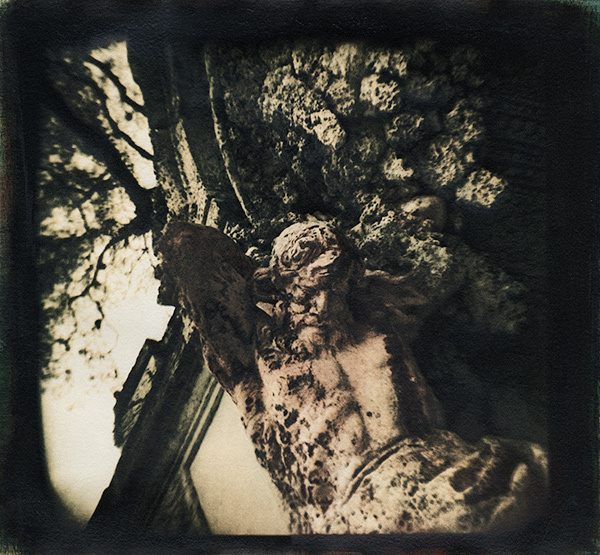 I discovered when shooting with the Holga, I am drawn to shapes and figures that appear to emerge from the darkness. The wonderful vignetting created by the plastic lens enhances this quality within my images. This enables me to capture soft, dreamy images reminiscent of historic photographic methods, evoking the misty quality of memories. Thus history and process inspire my image making process. I continue to collect things and images. And I am now beginning to photograph my collection of old and textured objects to revisit them in a new form of re-collected images. Sandra C. Davis was born in 1960s near Philadelphia. In the 1980s she discovered photography as a way to express her vision. She teaches alternative processes at several universities in the Philadelphia area. Her award-winning images are exhibited nationwide and are in public, corporate and private collections.